Pro-life house wife falls in love with the latest trend to hit New York City: handbags made out of fetal skin. Synopsis: When Pro-Life Denise runs into her long lost friend Helene, she's astounded. Helene is now a fancy, head turning looker who is nothing like the plain jane she used to be. They go to lunch and Denise discovers Helene's secret: a handbag made out of fetal skin. It is so elite, that ownership is entry into a secret club. 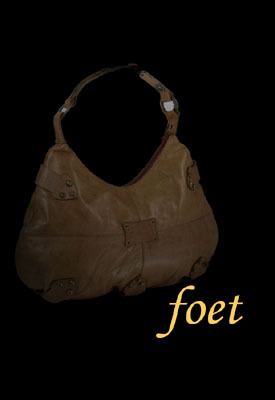 With her curiosity getting the better of her, she goes to the boutique to learn more about Foet. Unable to contain herself, she purchases one. But after a grueling nights sleep, she has second thoughts. She wants to do the right thing and return the bag. But...A model walks by with her own Foet bag and gives Denise the knowing look. Denise can't go back to being such a plain person. She needs some glamor in her life. So, she decides to keep the bag.